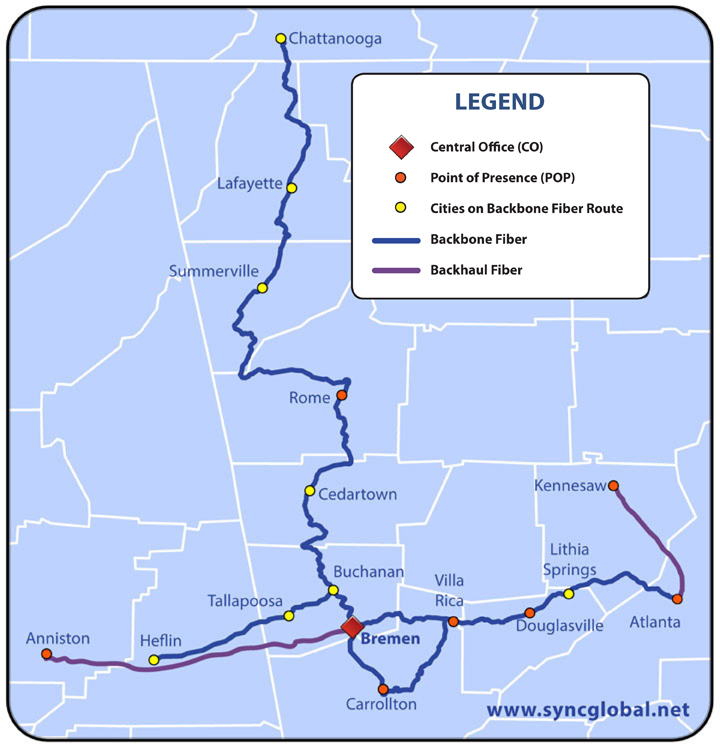 The SyncGlobal fiber network consists of backbone fiber that stretches east from Bremen, Georgia to Atlanta; west to Heflin, Alabama; north to Chattanooga, TN; and south to Carrollton, Georgia. Local fiber routes extend connectivity to business-class customers throughout the cities and business districts along the backbone network. SyncGlobal’s fiber footprint is further expanded with backhaul fiber to Kennesaw, GA and Anniston, AL, providing on-net service availability to these growth markets. Our fiber network is always expanding. Contact SyncGlobal Sales at 678-821-1138 or for updated information on new fiber routes. Not near our fiber? No problem! Click on the link below to see how we extend connectivity to customer locations across the state and across the country.